CALGARY, Jan. 31, 2019 /CNW/ - Ensign Energy Services Inc. (TSX:ESI) ("Ensign") and Trinidad Drilling Ltd. (TSX:TDG) ("Trinidad") announce that at the special meeting of shareholders (the "Meeting") of Trinidad held earlier today, holders ("Trinidad Shareholders") of common shares of Trinidad ("Trinidad Shares") approved the amalgamation (the "Amalgamation") of Trinidad and Ensign Holdings Inc. ("Holdings"), a wholly-owned subsidiary of Ensign. A total of 247,542,440 Trinidad Shares, representing approximately 90.52% of the issued and outstanding Trinidad Shares, were represented in person or by proxy at the Meeting. The Amalgamation was approved by approximately 99.97% of the votes cast by Trinidad Shareholders, either in person or by proxy at the Meeting, and by 99.96% of the votes cast by Trinidad Shareholders, either in person or by proxy at the Meeting, after excluding the votes attached to the Trinidad Shares held by Ensign acquired outside of its take-over bid for all of the issued and outstanding Shares, which expired on December 21, 2018 (the "Offer"), whose votes may not be included in determining minority approval of a business combination pursuant to Multilateral Instrument 61-101 – Protection of Minority Security Holders in Special Transactions. Subject to the terms of the amalgamation agreement between Trinidad and Holdings, each Trinidad Shareholder (other than Holdings or any Trinidad Shareholder who has validly exercised dissent rights in relation to the Amalgamation) will, upon completion of the Amalgamation, receive one redeemable preferred share of the corporation resulting from the amalgamation of Trinidad and Holdings (each, a "Redeemable Preferred Share") for each Trinidad Share. The Redeemable Preferred Shares will be automatically redeemed immediately following the completion of the Amalgamation for $1.68 in cash per Redeemable Preferred Share (the "Redemption Consideration"). The Redemption Consideration is the same as the consideration that was available to Trinidad Shareholders under the Offer. Registered Trinidad Shareholders should complete the letter of transmittal enclosed with the information circular and proxy statement mailed to Trinidad Shareholders for the Meeting and deliver the completed document, together with the certificate(s) representing their Trinidad Shares, to Kingsdale Advisors in accordance with the instructions set forth in the letter of transmittal to facilitate delivery of the Redemption Consideration that they will be entitled to receive upon the completion of the Amalgamation. A copy of the letter of transmittal can also be obtained under Trinidad's profile on SEDAR at www.sedar.com. Trinidad Shareholders whose Trinidad Shares are registered in the name of a broker, dealer, bank, trust company or other nominee should immediately contact such person to arrange for the deposit of their Trinidad Shares. Any questions may be directed to Kingsdale Advisors at 1-866-581-1514 or by email at contactus@kingsdaleadvisors.com. Ensign and Trinidad currently anticipate that the Amalgamation will be completed on or about mid-February 2019. The Trinidad Shares are expected to be de-listed from the Toronto Stock Exchange as soon as reasonably practicable following the completion of the Amalgamation. Trinidad or its successor will also apply to cease to be a reporting issuer under applicable securities laws as soon as reasonably practicable following the completion of the Amalgamation. Ensign is a global leader in oilfield services, headquartered out of Calgary, Alberta, operating in Canada, the United States and internationally. Ensign is one of the world's top land-based drilling and well servicing contractors serving crude oil, natural gas and geothermal operators. Ensign's premium services include contract drilling, directional drilling, underbalanced and managed pressure drilling, rental equipment, well servicing and production services. Please visit Ensign's website at www.ensignenergy.com. Ensign's Common Shares are publicly traded though the facilities of the Toronto Stock Exchange under the trading symbol ESI. This news release does not constitute an offer to buy or the solicitation of an offer to sell any of the securities of Ensign or Trinidad. Trinidad is an industry-leading contract driller, providing safe, reliable, expertly-designed equipment operated by well-trained and experienced personnel. 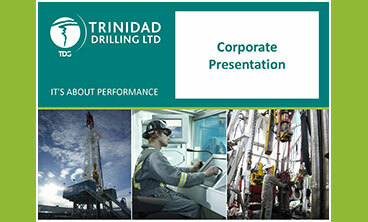 Trinidad's drilling fleet is one of the most adaptable, technologically advanced and competitive in the industry. Trinidad provides contract drilling and related services in the US, Canada, the Middle East and Mexico. Certain statements contained in this news release constitute "forward-looking information" within the meaning of applicable securities laws. Forward-looking information is not based on historical facts, but rather on current expectations and projections about future events and are therefore subject to risks and uncertainties that could cause actual results to differ materially from the future results expressed or implied by the forward-looking information. Often, but not always, forward-looking information can be identified by the use of forward-looking words such as "believes", "plans", "expects", "intends", "anticipates", or variations of such words and phrases or statements that certain actions, events or results "may", "could", "should", "would", "might" or "will" be taken, occur or be achieved. Forward-looking information contained in this news release includes, but is not limited to, statements relating to the timing of the completion of the Amalgamation, the redemption of the Redeemable Preferred Shares and the timing thereof, the anticipated de-listing of the Trinidad Shares from the Toronto Stock Exchange following the completion of the Amalgamation and Trinidad ceasing to be a reporting issuer under applicable securities laws following the completion of the Amalgamation and the timing thereof. Forward-looking statements are based upon the opinions and expectations of management of Ensign and Trinidad as at the effective date of such statements and, in some cases, information supplied by third parties. Although Ensign and Trinidad believe the expectations reflected in such forward-looking statements are based upon reasonable assumptions and that information received from third parties is reliable, it can give no assurance that those expectations will prove to have been correct. Forward-looking statements are subject to certain risks and uncertainties that could cause actual events or outcomes to differ materially from those anticipated or implied by such forward-looking statements. These risks and uncertainties include, but are not limited to, such things as new laws and regulations and failure to complete the Amalgamation in the manner contemplated by the parties or at all. Having regard to the various risk factors, readers should not place undue reliance upon the forward-looking statements contained in this news release and such forward-looking statements should not be interpreted or regarded as guarantees of future outcomes. The forward-looking statements contained in this news release are made as of the date hereof neither Ensign or Trinidad undertake any obligation to update or to revise any of the included forward-looking statements, except as required by applicable securities laws in force in Canada. The forward-looking statements contained in this news release are expressly qualified by this cautionary statement.